The surfing world was hit with a rogue wave this week with the unexpected passing of Sean Collins. This one leaves us all wondering what the hell? 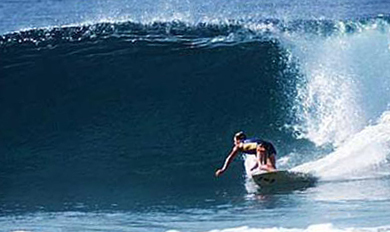 Sean was a great surfer, innovator, waterman, family man, and just a pretty damn good guy. He was young, 59, healthy, active and by all accounts you couldn't have met a nicer person. This was a guy who founded and ran a mega surf company, Surfline, yet would always return calls and e-mails personally. We got to know him when he contacted us about our original PaddleAir and told us he liked it. Needless to say we got right back to him and kept him supplied with the latest greatest through the years. He was very personable, and you just can't help admiring his accomplishments. Let's face it. Nobody knew what was happening with surf forecasting before Sean came along. Not the US Weather Service, not the stupid TV weather casters, not the wily old surf guy who told us "there's a swell coming next week." Not anybody. Then Sean started putting the puzzle of wind, currents, lengths between swells and all the rest together and bam: he changed the world. Today the world, and especially the surfing world, is not a better place. Damn it! We need people like Sean Collins! (I could certainly rant here about the people we sure as hell don't need.) He was a good guy, and will be missed for so many things. Our deepest sympathies to his family and friends. Yes, Sean, you will be missed.